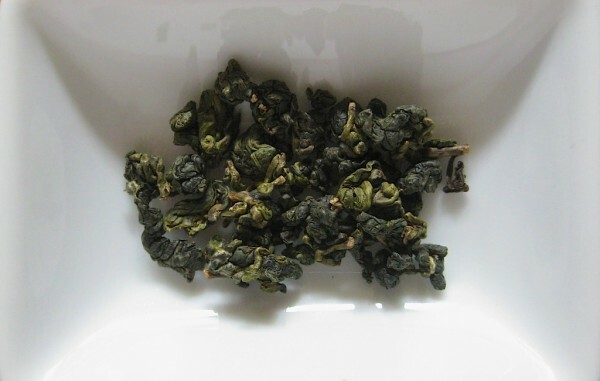 I have a very distinct fantasy about the oolong I want. I used to walk by this traditional old tea shop while on my lunch breaks when I was working in Japan. It was a tiny little hole in the wall place that roasted its own teas, and the aroma would waft out into the sidewalk and surround passersby in a bubble of fragrant delight. It was like a perfect aromatherapy infusion right in the middle of my work day. The problem, however, was that the place was SUPER tiny, and all the signs were written in Japanese that was WAY above my very basic level of understanding. Basically, the only way I would feel comfortable in there was if I already had an idea of exactly which teas I wanted to buy, because I did not have the language skills to ask all the questions I wanted to. Instead, I always ended up just going to the local Ito Yokado and getting a can of hot oolong there. I think the combination of the sensory experiences of the fragrance from the tea shop and the almost woody oolong tea in a can helped create this fantasy tea I have been looking for. I have been trying in vain for years to recapture that tea drinking experience. Richard (wandering to the other side of the store): So what is the tea you are looking for? Me (getting louder): Ding Dong Oolong!!! Richard (trying to contain giggles): Ding Dong Oolong? Are you sure that is the name? Me: Yep, I am sure. Ding Dong Oolong!!! I could not wait to get home to sample my latest tea acquisition. The first time I sampled it, I filled some of the rolled leaves into filter bag. 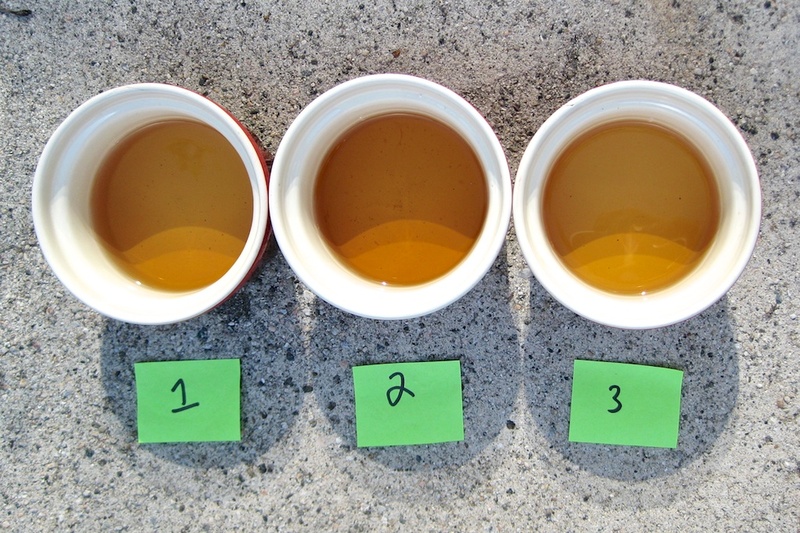 Although I have a few different tea strainers, I had read that Dong Ding oolong is really best appreciated by continually adding water to the leaves, and that each new brewing brought with it different attributes. My logic for using the tea bag was that it would be easy to just keep adding water to my cup as I drank. While the tea bags were a decent solution that produced a fine enough tea, it became obvious that the leaves really needed some room to expand and uncurl in the water. There is something almost mystical about watching this process, as the leaves twist and turn and almost spring back to life. 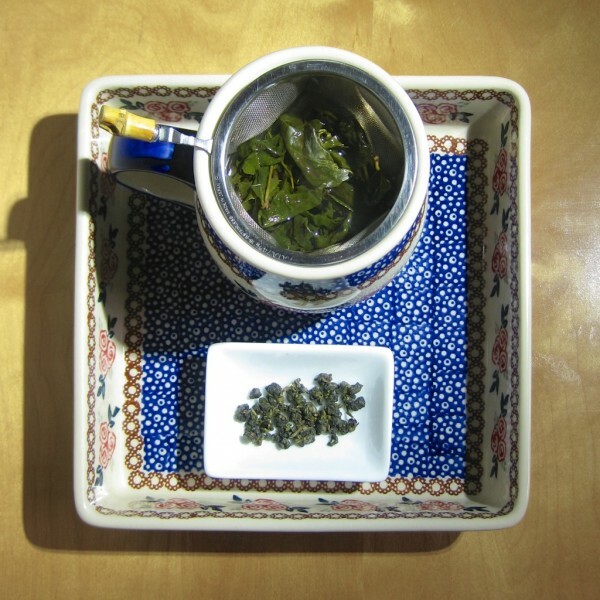 Since that first sampling, I have experimented with strainers, and now have settled on serving the Dong Ding in a tea pot with a strainer spout. The reconstituted leaves have enough room to fill the pot, and the additional space seems to allow the leaves to be reused at least twice more with outstanding results. You can see how big the leaves get when they uncurl! The first cup moistens my lips and throat. The second cup breaks my loneliness. The third cup searches my barren entrails but to find therein some thousand volumes of odd ideographs. The fourth cup raises a slight perspiration — all the wrongs of life pass out through my pores. At the fifth cup I am purified. The sixth cup calls me to the realms of the immortals. The seventh cup — Ah! but I could take no more! I only feel the breath of the cool wind that raises in my sleeves. Where is Elysium? Let me ride on this sweet breeze and waft away thither. 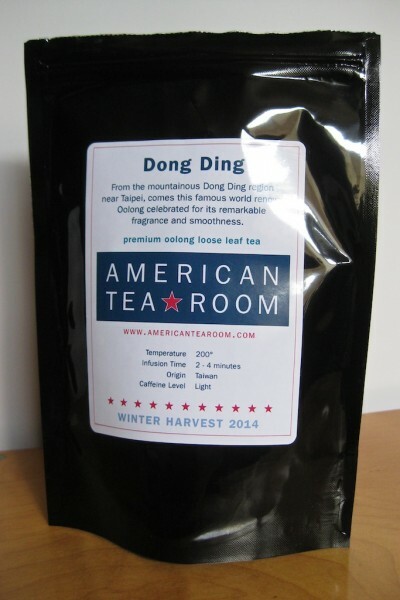 The first time I brewed the Dong Ding leaves, I was impressed by the aromatic floral notes. A surprisingly stronger, buttery flavor became dominant with the second brew. The color even seemed slightly darker in a side-by-side comparison. The third brew was softer, but still retained a considerable amount of the original flavor. I cannot overstate how impressed I am with both the taste and the longevity of the American Tea Room Dong Ding Oolong. 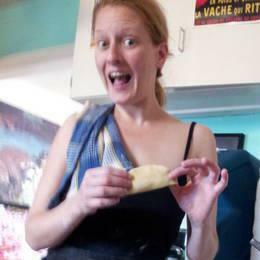 I did not try brewing the leaves a 4th time, so that “all the wrongs of life pass out through my pores” in that manner. I did take the beautifully saturated leaves to create what I consider to be the greatest tea mask money can buy, though. I have been using tea for years for skin care, thanks to my mother. (“Need a toner? Use some tea! Allergy eyes? Lay back and put some warm tea bags on them!”) Tea has always been a multi-use, everyday product in my life, but I had never thought about using tea of this quality for skin care. However, the leaves had retained so much of their flavor and aroma even after repeated brewing that I wondered if they might actually still have some of the vitamins and antioxidants as well. I make no claims about whether or not my skin received any vitamins, but this homemade mask was like a high end spa treatment. 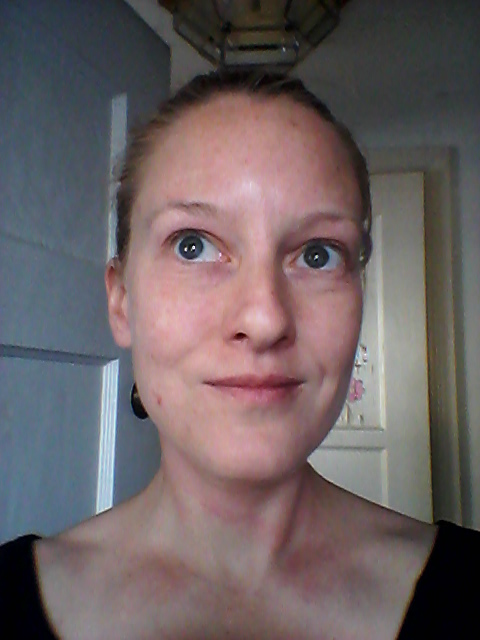 It felt wonderful and I am convinced that it really did make my skin look a little more glowing for days after. B said I looked like I had leeches all over my face, though, so I have to remember not to do a tea leaf mask again when he is around. I am thoroughly hooked on American Tea Room Dong Ding Oolong, inside and out!